Thanks Vince! Unfortunately I've been busy and my limited modeling time has been spent trying to finish up another major project, so haven't made any progress on this since posting this picture. Nice start on the cockpit! 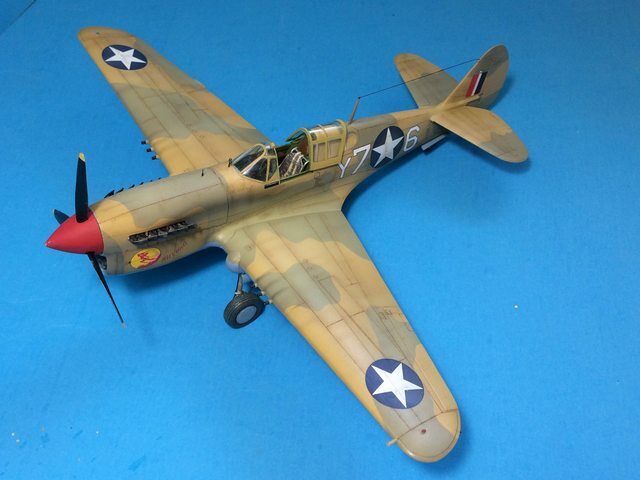 Just found a couple AMTech P-40's I had well along and then put away, starting those up again. 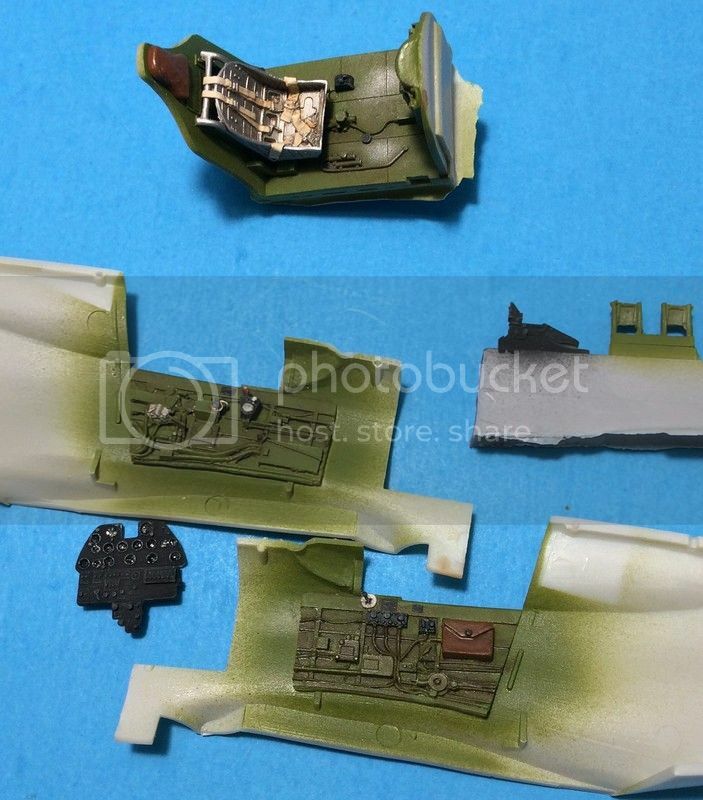 Also tried the Airfix 1/48 P-40 but gave up and will use it as a test bed, some of it was nice, other some weird engineering and did not go together well for me. It's been awhile but I've finally able to get some more work done on the kit. 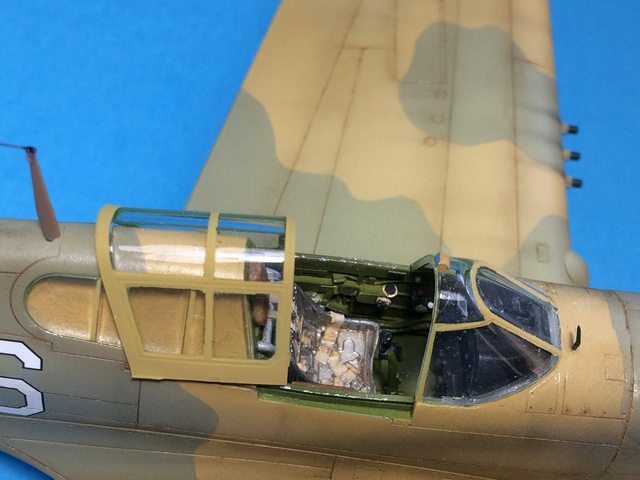 Following the carpenter's adage, "measure twice and cut once," I removed the front of the fuselage halves using a fine saw to make room for the replacement resin nose. Once done I glued the halves together. Fit was generally good, but having built at least a dozen of the AMtech kits (or its clones) over the years I've come to know what to expect and had no unexpected surprises. I also took this opportunity to clean up the seams, knowing it would be easier now rather than later. 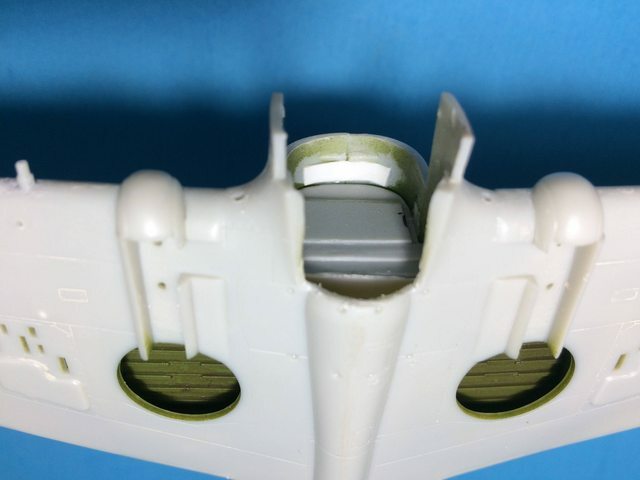 One thing I've learned with these resin noses, especially since Cutting edge has you remove material on the 'coaming' (as the instructions refer to it) to make room for the gunsight, there's not much contact area for the upper fuselage halves where the nose inserts. 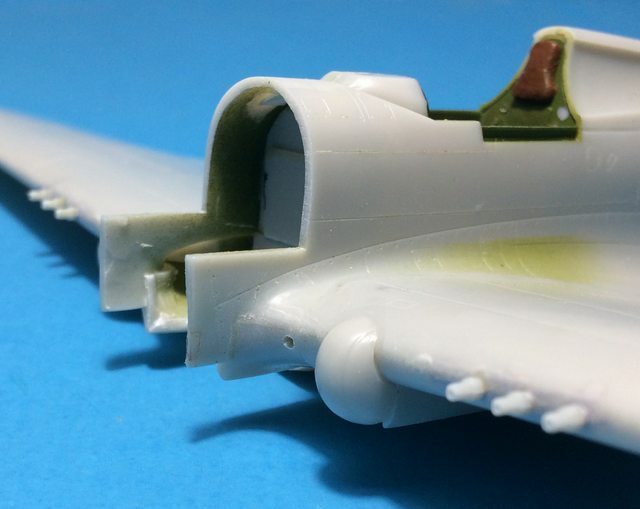 As a result I've added a thin strip of sheet styrene to the interior area, making sure it's far enough aft to not interfere with placement of the resin nose. 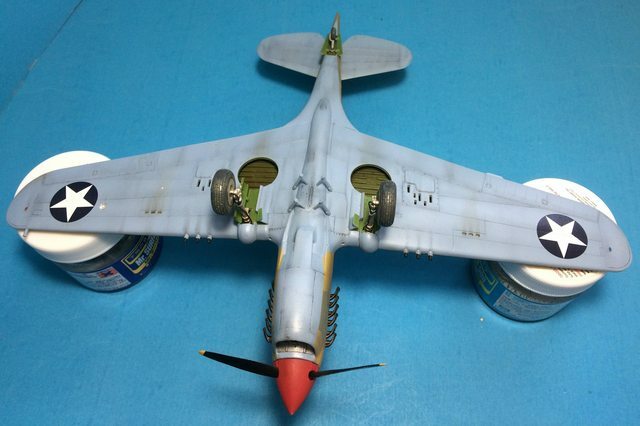 Upper and lower wings were glued together then the whole wing unit was glued to the fuselage, using some tape that went from one wingtip over the top of the fuselage to the other wingtip, which not only helped in getting some semblance of proper dihedral but also prevented any wing root gaps. 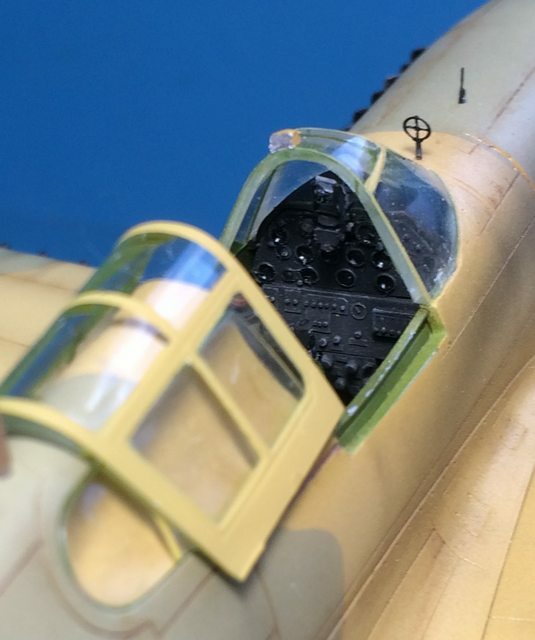 The seam between the upper and lower wings was then worked on, along with drilling out the gun barrels and the vent holes, with final touches to be done once the resin nose is glued into place. 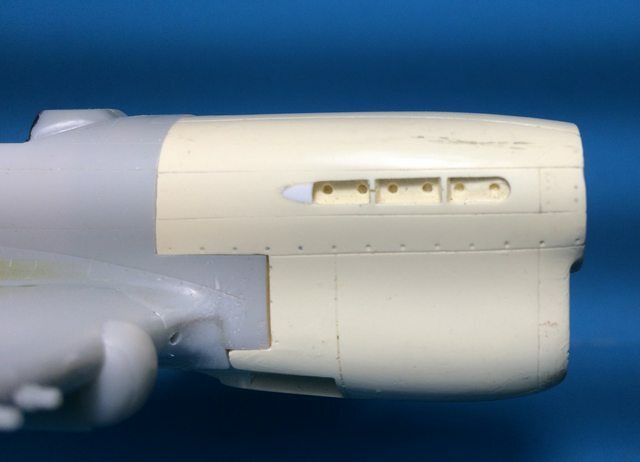 Temporary placement of the nose in the fuselage shows a pretty decent fit, although there's a bit of a horizontal gap that will need to be dealt with. You might notice a bit of styrene at the rear of the exhaust opening. 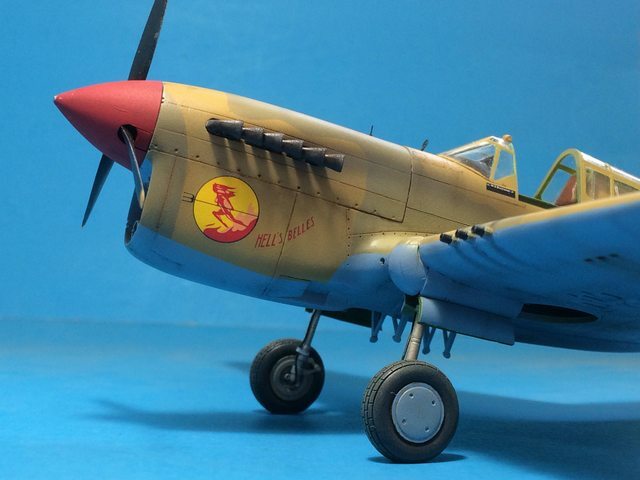 The resin nose has the "scallop" here, which was present for the tubular exhausts but not for the flared ones, which most P-40s from the long-tail F onward had. I also used pinpricks of superglue to fill the openings in front of the exhausts. For the life of me I have no idea why those are present, except perhaps as some sort of imitation of the perforated grill found on the M and N models. Nice job on the nose, making the cuts and getting it to fit. I have a resin nose from my kit, won't be using it, didn't feel like making the cuts so the plastic nose looked good enough to me. 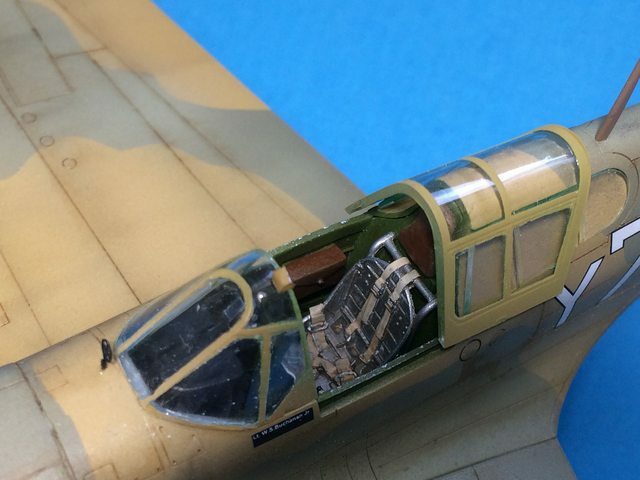 Great job fitting that resin nose! After a primer coat to check for flaws, which of course there were some that needed attention, it was off to the paint booth in the garage, with a substantial delay due to the cold and wet weather we've had in my area for weeks. It's been dry recently, and although not as warm as I'd like, I had the opportunity today to get some painting in so decided to make the most of it. I used a combination of Model Master and Sovereign Colourcoat enamels, fading the upper colors with whatever I had on hand to add to the middle stone and dark earth. I had planned to do a soft-edge camouflage scheme, but discovered that my Blu Tack had dried up. It was several years old, but I had kept it in a Ziplock back after I had opened it, to no avail. As a result, I spent a considerable amount of time cutting out masks using Tamiya tape. Fortunately, I didn't have many of the obvious ridges that can happen when masks are used, and I had no over-spray or mistakes that needed to be corrected. I did end up breaking off the pitot tube and flinging it up in the air, but luck was on my side and it landed right next the plane. I'll glue it back on when I attach rest of the final bits. I love those desert colors on the Warhawk. Also great job with the color modulation, looks realistic. Thanks Vince. That fading is the first step in my weathering process. 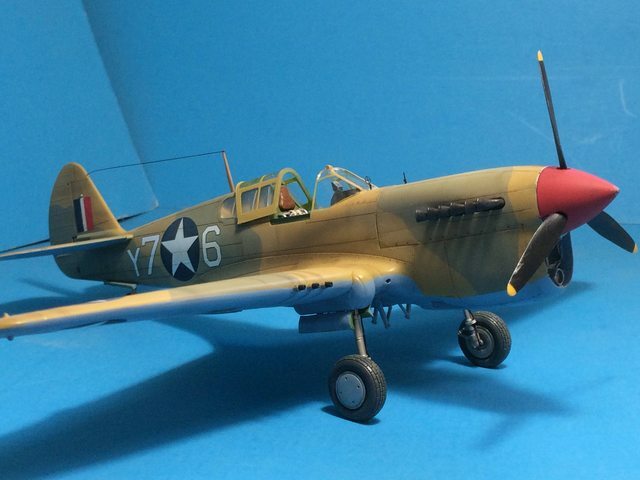 I’m still striving to get that really worn, weather-beaten look on some of my models. Your paint work is coming along nicely! Thanks! Unfortunately nothing has progressed on this model lately, but hopefully with an improvement in the weather this week I can get some more work done. 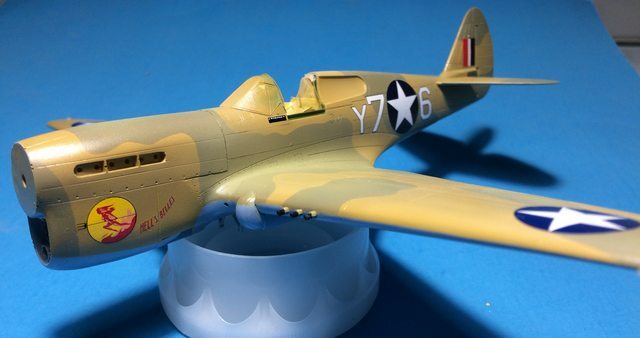 I airbrushed a highly thinned mixture of yellow and sand to 'blend' the upper camo colors a bit and just applied the decals, although I still need to brush on some more MicroSol to get them to lay down better. Most of them are Sky Model, which went down quite well, although I ran out of national insignia so had to use others I had on hand. 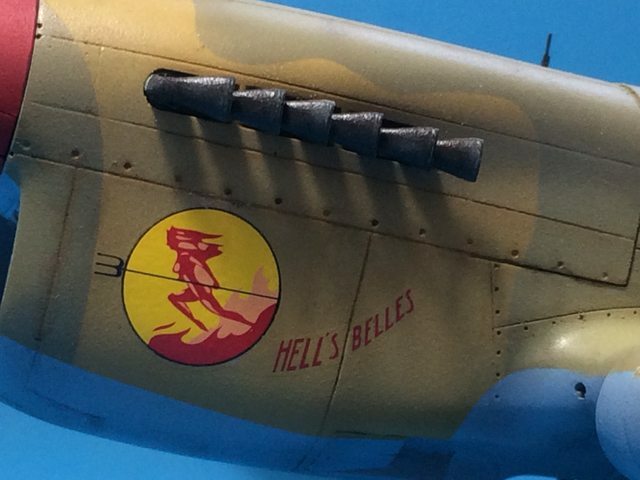 I believe there were at least two Y76s with the 316th FS. I think this was the first, which was heavily damaged by a Mc202 on 8 July '43 and, although it got its pilot 'Buck' Buchanan back safely, never flew again. Just finished it a bit ago. Unfortunately, it appears I lost the pitot tube I had previously broken off. I'll keep looking for it although I have the unpleasant feeling it ended up in the trash at some point, so if I don't find it I'll have to steal one from another of my unbuilt AMT kits. That being said I'm pretty happy how this one turned out, although there are always more or better things that can be done. The photos really show how thick the clear parts are, making me think about using vacuform ones in the future, although I really don't like working with them.